Full of gossip, energy, and enthusiasm, Marie-Louise Painchaud (Patricia Cano) is instantly likeable. Telling stories, spinning fantasies, and dreaming about her future, her stunning voice is accompanied on stage by piano (Michael Creber) and saxophone (Chris Startup). Working in the post office of small-town Lovely Ontario, Painchaud knows everybody’s business. She hears all the latest gossip when people drop off their packages, and has no shame in holding a letter up to the light to read its contents. The contents of these letters, inspires her daydreams and fuels her fantasies. “Imagine,” Painchaud says often, with her wide-eyed smile, as she discusses tales of love, heartbreak, and tragedy. She has never travelled anywhere, and has been working in the little post office for 40 years, reveling in the small-town intrigue of postal work. Each letter Painchaud picks up tells a story, and each story sparks a song. With her French Canadian Cree charm, a mischievous glint in her eyes, and ability to hold a note, Cano kept our attention and drew us into her daydreams. 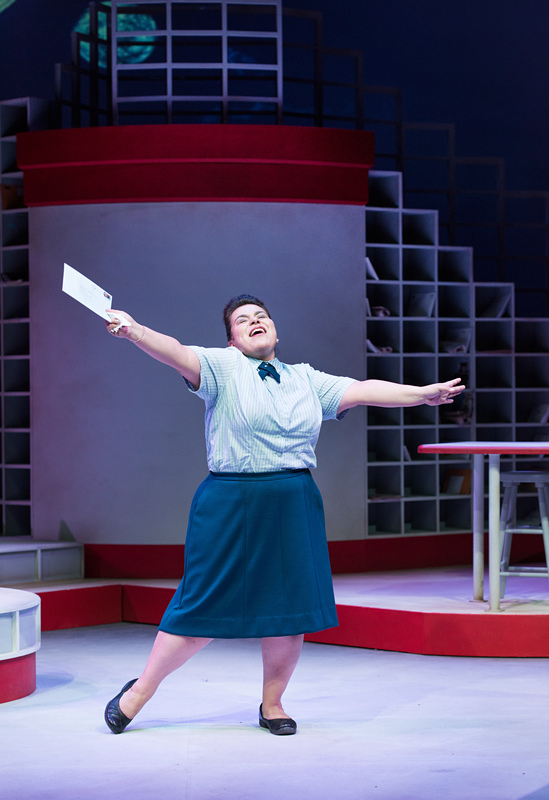 Tara Cheyenne Friedenberg’s choreography added just the right amount of playful charm to the musical numbers, and the post office set by Ted Roberts provided a quaint backdrop. The songs were charming, as were Painchaud’s anecdotes about small town life in Ontario, but there wasn’t a lot of plot to hang those stories off of. The series of seemingly unrelated songs was paired with interludes about Painchaud’s own life and marriage, but we never got deep enough into that narrative to feel invested, and there was no conflict or resolution that we were waiting for at the end. That might be my only disappointment with this cabaret style show — it was entertaining, and Cano’s performance was endlessly impressive and humorous, but I felt like I was missing something to root for; an outcome to hope for. In the end, though, maybe that doesn’t matter when the point is to be entertained by the charm of this quirky collection of songs.